For RRS James Cook Voyage 67, we are in the Indian Ocean, hoping to obtain another missing piece in the global "jigsaw puzzle" of life at deep-sea volcanic vents. Most deep-sea vents are found on the mid-ocean ridge - a chain of undersea volcanoes that runs all around our planet. But although we have known about deep-sea vents for more than thirty years, we have still only explored a fraction of the 40 000 miles of mid-ocean ridge for hydrothermal vents. 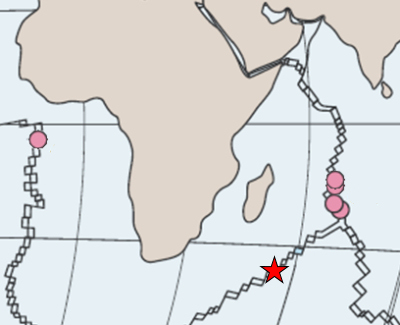 In the Indian Ocean there is a junction between three sections of mid-ocean ridge. Near the island of Rodriguez, the mid-ocean ridge splits into three: one branch runs north (known as the Central Indian Ridge), while two other branches stretch away to the southeast (the SE Indian Ridge) and southwest (the SW Indian Ridge). Four deep-sea vent fields have been seen and sampled so far on the Central Indian Ridge, but deep-sea vents have not yet been sampled on the SE or SW Indian Ridges. The SW Indian Ridge is different to the other two: it is less volcanically active, and so we think deep-sea vents should be spaced further apart along it. This may make the marine life at vents in the SW Indian Ocean different to other sections of ridge: perhaps only species that can cross larger distances between vents can survive there. In 2007 a Chinese expedition revealed a vent field on the seafloor of the SW Indian Ridge for the first time, but their survey was not designed to collect samples from it. So now we are heading to that first-known vent field on the SW Indian Ridge, to collect the first specimens of the creatures that live there. By comparing the animals that we find with those known from other vents, we hope to understand how differences in volcanic activity may affect the distribution of life along our planet's longest mountain range. One of the reasons that the southern Indian Ocean is less explored than other oceans is its remoteness. So for this project, we are taking advantage of a rare opportunity. The RRS James Cook was already scheduled to be working in the Indian Ocean for another project (which you can read about here), using a deep-diving remotely operated vehicle to explore underwater mountains called seamounts. Our team is therefore 'borrowing' the ship for a few days during that project, and diverting it to the nearby vents for our work. 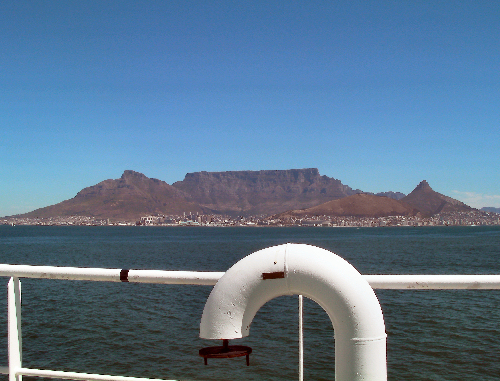 We sailed from Cape Town in South Africa on Monday 7th November, and the RRS James Cook has been working at seamounts since then. For details of the separate seamounts expedition, which is led by Prof Alex Rogers of Oxford University, please visit the seamount project webpages. 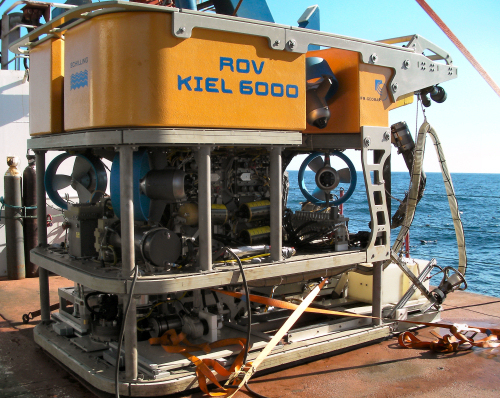 For this expedition, we are equipped with the Kiel6000 ROV, a remotely operated vehicle from Germany, as the UK's Isis ROV has not yet been repaired after its accident in January. 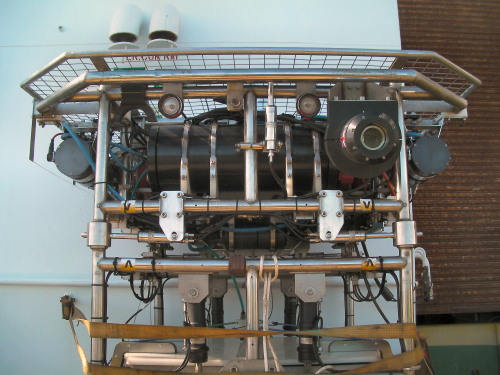 In addition to the Kiel6000 ROV, we also have the HyBIS vehicle aboard, which we previously used to reveal and sample the world's deepest known hydrothermal vents. The vent field that we are visiting on the SW Indian Ridge lies at a depth of 2.7 kilometres, well within reach of the Kiel6000 ROV and HyBIS if conditions are right. We expect to get to the deep-sea vent field sometime around November 27th, and we hope to provide daily updates during our few days work at the vents. The vent field lies at latitude 37 degrees South, which is almost in the "roaring Forties". If a storm blows through the area during the few days we have allocated for our work at the vents, conditions could hamper what we can achieve. So right now we are hoping for the best, and planning for the worst. 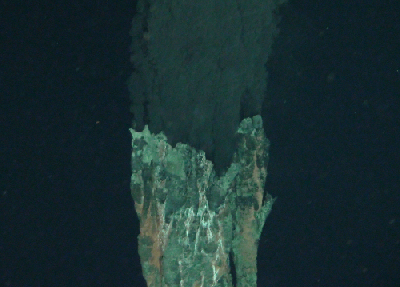 The mineral chimneys at deep-sea vents are rich in metals such as copper, zinc, and even gold. The United Nations International Seabed Authority, which oversees deep-sea mining in international waters, recently granted China a licence for exploratory mining on the SW Indian Ridge, including at the vent field that we are visiting. But no-one yet knows what actually lives there. We therefore hope to reveal the inhabitants of these vents to the world for the first time. For more information about mining at deep-sea vents, please see the links page for this expedition.